A number of important announcements were made in the last week (1st/5th April 2013) which could have a profound bearing on the future of Wicklow Harbour – either for its betterment or in a worst case, its demise! Firstly, the Minister for Transport, Tourism and Sport, Leo Varadkar, announced the New National Ports Policy which effectively hands over control of Wicklow Port from the Department to the local authority, Wicklow County Council. 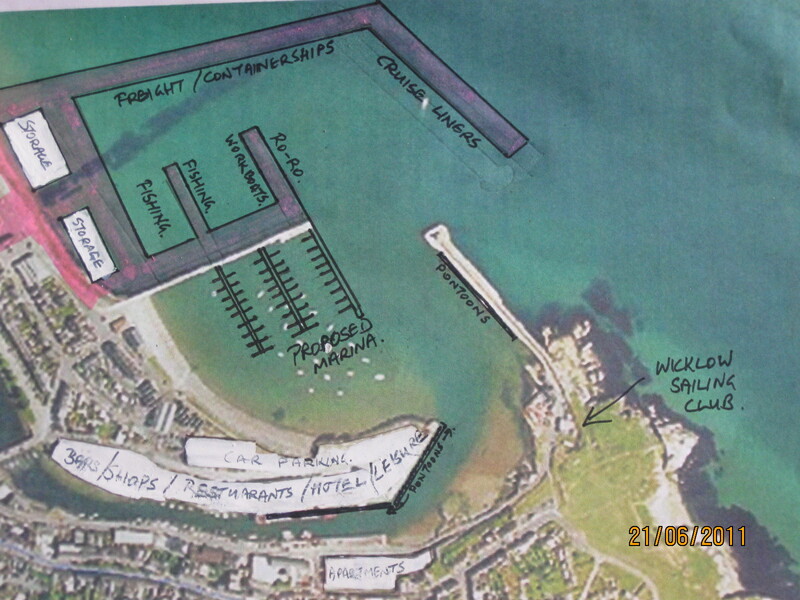 With a new board in place and a local controlling body, it would be the hope of all marine minded Wicklow residents that the Harbour will finally be run for the benefit of all its citizens and that they will look to the future by developing a new commercial entity beside the existing harbour. The second item of good news was the announcement by Fred Olsen Renewables that they have planning permission to erect 220 windmills on the Codling Bank, c.12 miles from Wicklow Harbour. They also have applied for a further 200 windmills. This would mean that there could be up to 10 years work constructing these windmills and after that ongoing service needs to create substantial employment for the citizens of Wicklow town and the county. These coincidental announcements could mark a Red Letter week for Wicklow – if the new Port Company, supported by the County Council, might see Wicklow Port as being the potential hub for building and servicing this massive windfarm undertaking. The controlling company for Fred Olsen Renewables is a worldwide Shipping and Engineering conglomerate with the resources to probably substantially fund a new harbour development. Obviously, it would be in the interest of future generations of Wicklow residents that our own County Council/Port Company should also invest in any new development, to keep some control over its asset. Fred Olsen operate ferries, cruise ships, all types of commercial shipping, oil tankers, and a huge range of other related interests, including wind farms and other energy renewables. With their financial muscle, the cost of building a new breakwater and quays would be well within their reach. Their input could guarantee suitable facilities to accommodate all types of shipping required for delivery of the hardware as well as the service vessels. An added bonus could be the ability to handle larger commercial ships for Wicklow Port and even Cruise liners. One of the great assets that Wicklow can offer is the fortunate convergence of the new Port Access road, the Railway and the possible extended Harbour just to the north of the town. Not many marine sites can offer such a land/sea benefit and our new Port Company directors should start focussing their minds accordingly. Should Fred Olsen decide to select Wicklow as its service hub, anywhere from 200 to 400 jobs and spinoff sustainable enterprises could be generated for the general Wicklow area. The only other realistic service port on the East coast of Ireland is Dun Laoghaire, as Dublin Port is already close to capacity. So far our Town Council, the Chamber of Commerce and Port Company have failed to put any sort of plans into the public domain over the last 15 years to develop the towns greatest asset. A quick look at the last 3 Town Development plans will show a serious lack of foresight by these bodies when it came to its ideas for utilising Wicklow Harbour to its maximum advantage. On that note, I personally submitted Harbour development ideas for each of those three Plans – nothing was published – I rest my case. Perhaps, Wicklow County Council and the new Port Company directors will bring a new broom to the table – at least, this correspondent hopes so. At a time when families are being divided by the curse of emigration yet again, this small town has a golden opportunity to buy into creating a future for several generations of its school leavers, so hopefully wise heads will grasp the nettle and at least talk to Fred Olsen Renewables with a view to seeing if they might be interested. Another opportunity might also be out there – if OIL is discovered off the East Coast, Wicklow could be best placed to also service that industry – if we have a suitable harbour. Of course, a new commercial harbour could have knock on benefits for the existing harbour, allowing it to become a tourism focal point for land and sea based visitors. By clearing the old quays of their ugby commercial buildings, leisure facilities including hotels, restuarants etc could live side by side with a marina. Wicklow could develop several hundred tourism related jobs on top of the windfarm service jobs – another major plus for the town and its environs. 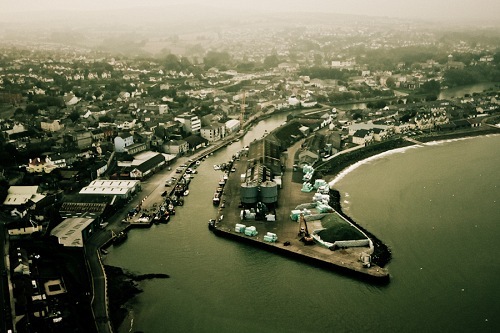 Looking to the future – could Wicklow see a new Harbour? Should the powers that be in our community let this opportunity go, Wicklow Harbour will continue to stagnate and deteriorate. The East pier, developed over 100 years ago under the watchful eye of Wicklow’s premier citizen, Captain Robert Halpin, is in need of serious repair. If it is breached, the existing harbour will become non-viable. Several Harbour Boards and Port Companies in my 30 years in Wicklow have run the Harbour as an exclusively Commercial Shipping entity, paying only token lip service to fishing, other commercial operations, sailing and other leisure users. The Harbour should be an asset that all those with an interest in the sea, whether commercial or leisure, all of whom should have a say in its operation. Our taxes have supported it but only a select few have had a voice. Maybe the new Port Company Directors in tandem with Wicklow County Council will see the potential for approaching Fred Olsen Renewables – I’ll wait to see if a miracle might happen. Wicklow Harbour deserves a chance to join its bigger brothers around the coast to provide sustainable employment and enterprise for its population.Grasp the bull by the horns now – this opportunity won’t come again. Sorry for being off the airwaves for so long. This entry was posted in Sailing, Wicklow and tagged fred olsen renewables, port company, wicklow, Wicklow harbour, wicklow sailing club, windfarm by Charlie Kavanagh. Bookmark the permalink. Many years ago I wrote articles for a magazine named Marine Engineering/Log. When I arrived here and saw the harbor I suggested to the editor an article on Managing the Small Harbor. Never got a response.